And my crazy continues to rein supreme around these parts, which mean I have not been cooking at all these past weeks. Unless I can post how to make a awesome grilled cheese. Let me know, because that is what we been eating for the past weeks. But, I promise that I’m getting back to cooking. But, we been trying our hardest to have some fun. Trying to run away from the scorching heat that we are experiencing here in Florida, this past Saturday we joined my very good friend Steph from Kitchen Kilometers and woke up at an unholy hour to hit the road early and headed north to enjoy floating down a very cold freezing Florida spring in a flotation device. Since we knew were not going to be allowed to take anything with us during our 2 hour trip down the river. We kept our food choices simple because they were going to sit inside a cooler in a hot car before we could eat it – sandwiches, fruits, lots of water and hard boiled eggs (hey, I was craving them when I got them at the supermarket the day before – don’t you judge) made the menu. Nothing came untouched, except the hard-boiled eggs. So Sunday while checking the refrigerator for our breakfast choices, I spied the boiled eggs and decided make deviled eggs for breakfast. What? 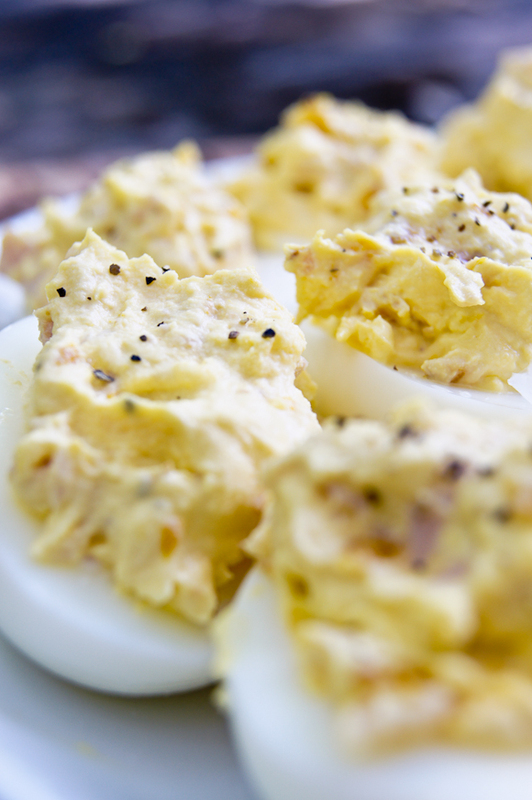 You don’t eat deviled eggs for breakfast? That is a practice that I totally suggest you take up – pronto. There is no trick to this recipe. 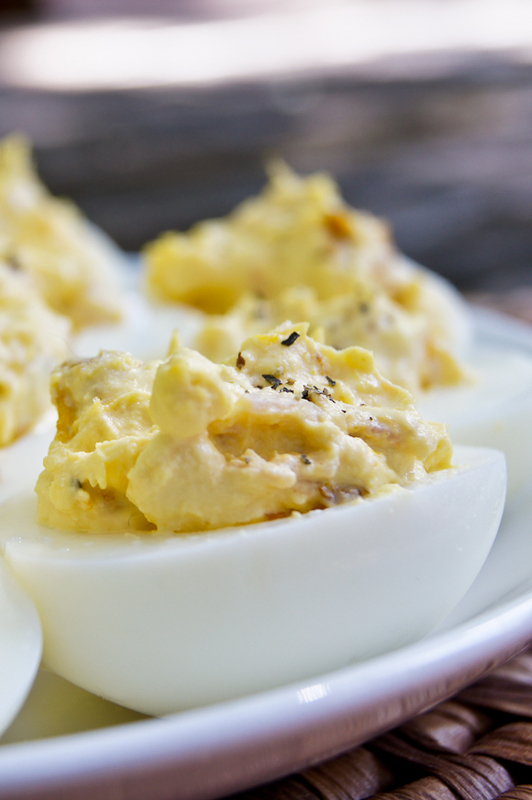 Boiled eggs, cut in half, yolks removed to a bowl where you add what ever you want and then good all mayo to married it all together I’m a huge believer that deviled eggs are very forgiving when it comes to flavor combos. I decided to just get creative with what I had in the refrigerator in this case – ham, roasted red peppers, a bit of spicy, some anchovy paste and then voila – see them go FAST. And nobody will notice that they are eating a deviled egg for breakfast. They will just ask you to make more. Boiled your eggs. Don’t know how to, check out Market Manila) – or you can go and get them already boiled at your local supermarket. After they get cold, cut them in half and scoop out the yolks. Place them in a bowl and now add the rest of the ingredients. Before you fill out your whites, sprinkle a bit of salt on them, and then fill them up with your yolk mixture. Sprinkle with a bit more salt and ground pepper and if you want some more chopped parsley. I like to serve them at room temperature – not to cold, not to hot. Now go crazy, see what crazy flavors you can come up with. And make them for breakfast. PS: a quick tip.. you can turn this into egg salad, by add the white and chopping everything up. Then toast some bread and you are in business!